I’m loving my new set of princess cookie cutters, so today I made peanut butter and grape jelly castle sandwiches! Peyton said she needed two sandwiches because once you cut them into the shape they are too small. So be mindful when using cookie cutters. Sometimes you may have to make two sandwiches to give the kids a decent size sandwich. To help combat waste, I try to use the peanut butter and jelly in the center where the cookie cutter shape will be. Then I’m only wasting the bread. As I was cleaning out our fridge I found one lonely fruit cup. It was set to expire soon so in the lunch box it goes. 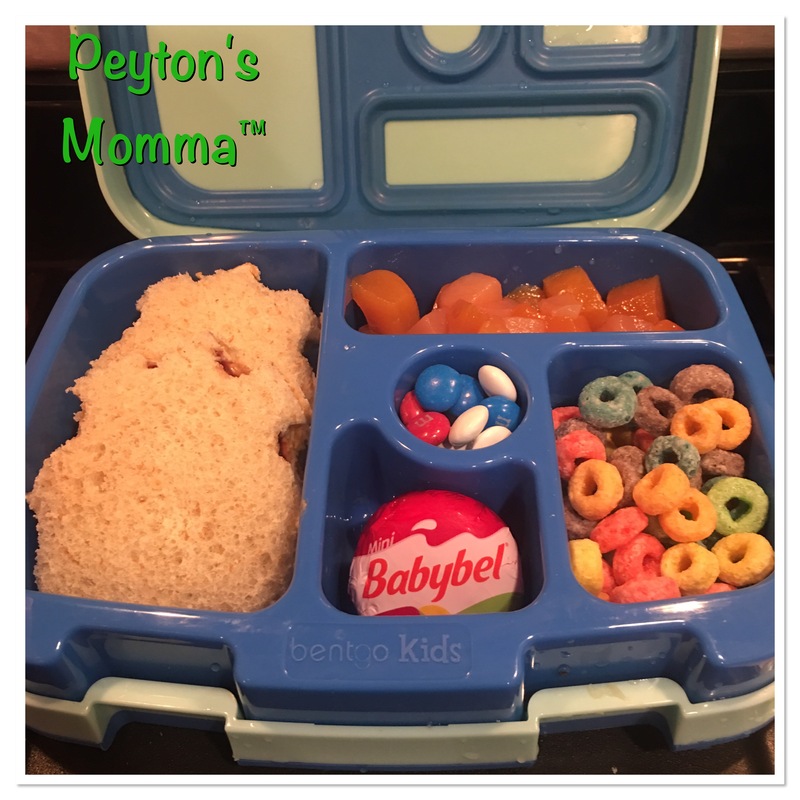 I always try to keep a variety of canned fruits on hand, especially in the winter, so there’s plenty of variety in Peyton’s lunches. I just drain the packing juice off before I add them to the lunch box. Peyton recently discovered Fruit Loops and thinks they are spectacular. I thought I would surprise her with a few in her lunch box. And I threw in a Baby Bel cheese to offset the cereal. Lastly, I added a few red, white and blue M&Ms. Go Team USA!